If the question is “what do you see in the near future of the web?” my answer is for sure: “I see the explosion of vertical geography”. Nonetheless, while writing this post, I’m sure the value and the relevance of “Vertical Geography” have not been generally perceived yet. But I want to add more details to my statement. As a consequence of the launch and spreading of GoogleMaps, I saw a new science taking place. In my mind, I call it “vertical geography” because it offers the ability to store data and content on a map, adding a vertical layer of information over the traditional horizontal one. Since Google opened its service, many things changed for geography but I see the best yet to come. At the beginning (February 2005), GoogleMaps appeared to be a sort of “exercise”, a geeky tool for the web surfers, who could have fun waiving through the maps of cities, vacation places and meetings. The real power of the tool was not clear at that time. But now, GoogleMaps is no more a simple gadget of our websites. With millions of information stored in its graphical layers of seas and mountains, it makes a totally different sense: it adds a new dimension to geography and our knowledge. Being passionate for geography, I perceive this power coming out powerfully. Thanks to GoogleMaps we have a fully new approach to the way we mentally and physically organize and propose a bulk of information. By definition, a vast majority of the data we store in our minds is ideally connected with some places on planet Earth (and not only there but also on Mars, the Sun, Jupiter!). Adding generic details about data location can be the first step to localize them. Placing data on a map is the next big step ahead. This process happens because giving a visual approach is a tremendous help for recognition and storing of the information. Commercial activities are the ones which immediately, and more than everyone else, benefits of the vertical dimension. But they are not alone. The possibility to create new virtual services is huge and only a small part has been explored and exploited till now. Some examples? 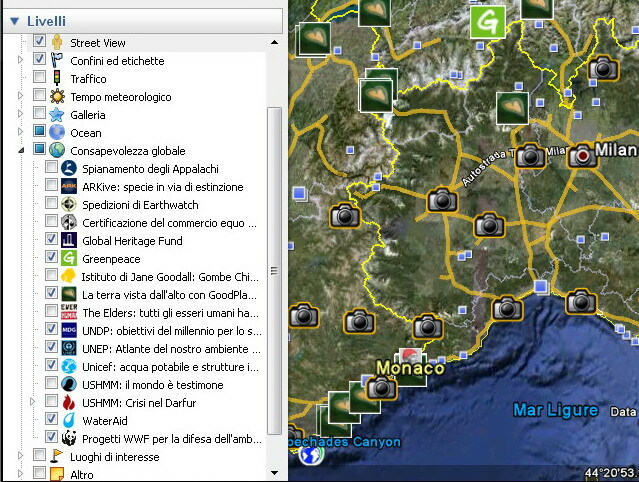 Download and launch Google Earth. Have a look at the left-hand menu of layers to switch on and off. What do you see? A lot! From hotels to restaurants, from hospitals to B&Bs, from charities to international organizations. Almost everyone wants to be placed somewhere on Earth! The recent explosion of location-based social networking like foursquare and gowalla (Google and facebook replied with Latitude and places) give us the taste of what we can see in the near future. Moreover, thanks to mobile devices, interaction is becoming mobile itself. While walking around the city everyone becomes a source of information and, at the same time, an information seeker. So we come to the next big step. We have been talking until now of human beings and their activities. But what if also inanimate objects would have tags, labels, signals, voices and a digital soul? What if walking around I could receive messages from the world surrounding me? I would be living in the Augmented Reality: a world where interacting with matter is much more developed than today. Where I would be fully communicating with everything around myself. A vast scenario is still to come and it is closer than it seems to be. My doubts are related to the way we will be able to manage and filter such an amount of information. Search engines, which solved the problem at the beginning of the Web, won’t be enough. We need something more active than passive: an active tool which pre-digest information in order to create a good-size information bulk that we can later manage. I’m still not sure what these tools will be like. 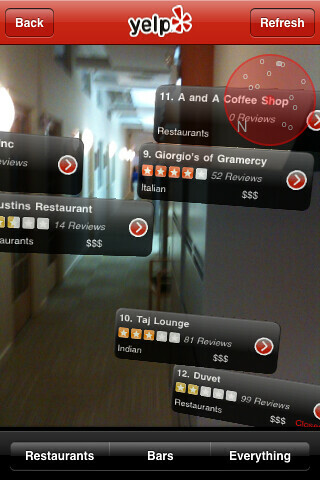 Categories: visions | Tags: augmented reality, business, dimensions, foursquare, geography, Google, Google Maps, gowalla, maps, reality, services, tagging, tags, vertical geography, yelp | Permalink. A new challenge for the iPhone was launched yesterday: it is the first mobile phone with Android inside. Even if not everybody seems to be so enthusiast about the product, more than everything else in the DEV perspective, at least, I see a very interesting trend for prices. The announced price is 120 Eur (at certain conditions) which is fine is compared with many other models and the iPhone itself. So, the tendency of prices to get lower is happening this time as well and we can really start thinking about a wide spread of these tools, also in developing countries. Linking this news with the possibility of wider access available in two years time, than the scenario could be very much different in the near future. Are WE going the same direction? Will we be able to provide good services for that time? How much time do we need to design new services for these devices? Are our Human Access Points ready to help us designing them? 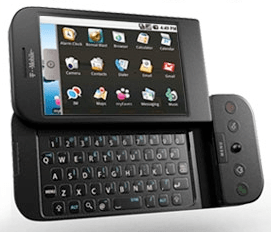 Categories: news | Tags: access, Android, cellphones, communication, development, devices, HAP, HTC, infrastructure, iPhone, mobile, services, technology, telecommunications, tools, wireless technology | Permalink.